Gourmet burgers have been a thing for a while. 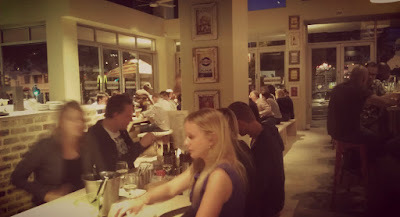 We have a bunch of restaurants in Cape Town dedicated to providing those. Gourmet hot dogs have been tipped as the new big thing and a few restaurants such as The Power & The Glory have a gourmet dog on their menu, and one restaurant has dedicated itself to the product and that is On A Roll. So gourmet boerewors rolls are the next natural progression. It comes with some risks though. When I’ve mentioned it to people they have often responded that they can’t see themselves paying for something they can have on the braai at home. I think that misses the point. Firstly, we don’t eat out just for the food, we eat out to be social. Secondly, there is a difference between a boerie roll off the braai (a beautiful thing indeed, and well on its way to gourmet with the mere addition of Mrs Balls chutney! ), and a boerie roll where time and attention (and skill) have been directed at every element, from the roll (they offer 3 kinds including rye) to the boerewors (choose from beef, chicken, ostrich, lamb or traditional with added pork), to the selection of toppings (which I will say more about a bit later). This is not just a boerie roll, this is a gourmet boerie roll, and you’ll be missing out if you ignore it. Let’s talk about the food first. 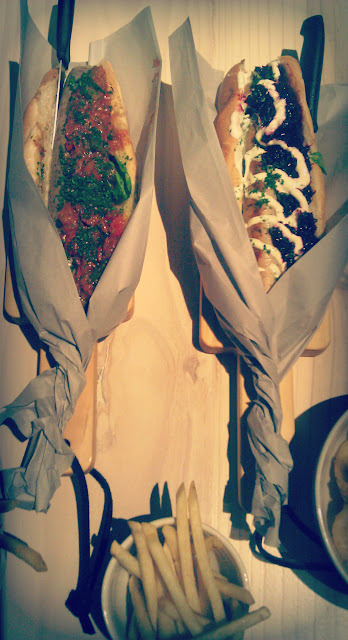 I must admit, I was a little nervous for the guys because everybody likes their boerie roll a different way. They have their favourite kind of boerewors, some like chakalaka, some (like me) want Mrs Balls chutney, others want it naked (the boerie roll, not the eater). The boerewors roll could almost be considered a national dish, so chances are that people will be quite critical. While there are some things about Gourmet Boerie that I didn’t like (carry on reading for those), the actual boerewors rolls are fantastic. I wasn’t daring enough to try the wholegrain or rye roll, but I chatted to someone who had the rye and apparently it’s soft and subtle (70% if I remember correctly). My white roll was perfect, just the right density to hold the boerie roll together but not overwhelm the actual boerewors. The most important part is the boerewors. They offer 5 kinds and I tried 4 of them! The only one I haven’t had is the lamb. I like all of them, even the chicken. Normally chicken sausage is not great but this one is quite thick with firm texture and good flavour. All of them are quite low fat, and fine minced but still very juicy. They do not have the taste of braai but the they do taste great with well balanced spices (Gourmet Boerie’s own recipe) and quality meat. I would say the Mexicano and the Pure Sophistication were my favourites. But I also had a delicious one which was not on the menu, beetroot, creme fraiche and chives. I had that with the chicken sausage. Before we leave the food, we must talk about the desserts. Sticking with the South African theme, the desserts include koeksisters (R25), trio of ice cream (R30) and the highlight, which is what we ordered, mini dessert platter (R35). 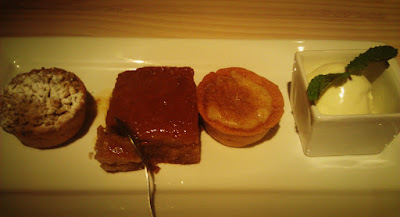 It has a mini apple crumble, milk tart and malva pudding, served with a scoop of ice cream. The desserts are served warm and they are delicious. Good balance of filling to pastry and great filling. Definitely enough to share between 2. That’s all I have to say about the food, so what about the venue? 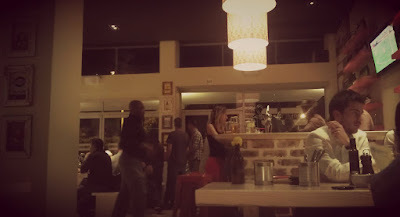 Well, it’s very modern with strong SA theme, right through to two televisions on the wall showing sport. The place looks good. 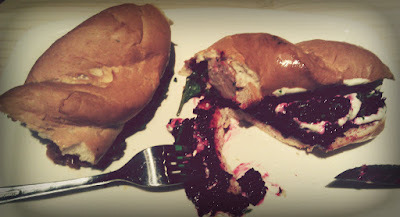 It looks relaxed, more boerie than gourmet. Tables with benches. Rustic framed old school SA nostalgia. There is a bar with a selection of craft beers on tap. There are bar stools. There are some outside tables. There are bad acoustics. This is the one serious problem I have with Gourmet Boerie, it’s not possible to hear what the person over the table from you is saying. This is perfect if you’re out with someone who isn’t very interesting, but I tend to choose my dining partners more carefully. There were just 2 of us and we couldn’t hear each other, I can’t imagine trying to hear people in a larger group. I can’t comment on the service because it’s a self service vibe, like Nando’s. You go to the bar and sign (because he won’t be able to hear you) your order and pay for it. You get a number for your table so that your food finds you. I haven’t decided if I like self service yet. I’m quite lazy and I hate queues, so it’s not ideal as you have to wander off and queue to place your order and pay. The whole time you’re suffering from severe FOMO because you think everyone is having fun at the table without you. Then you remember they can’t hear each other so chances are slim. Overall a great experience and definitely worth a visit. Great review. I really enjoyed this place and the concept. Unfortunately the Herbiwors is not vegetarian, only the Veggie Vibe. But us veggies can’t be looking for vegetarian food at a Boerewors place! 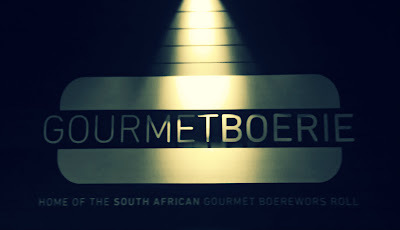 Last night I went back to Gourmet Boerie for a follow up visit. Both of the issues I wasn’t too excited about seem to have been sorted out. There is now waiter service so you don’t have to go and order from the counters. I personally think it’s much better this way. I was there to catch up with a friend and it meant I didn’t have to waste half of our valuable catch up time in a queue. The sound seems to have been sorted out as well. I could hear my friend, I could hear the waiter, and I could even hear some background music too. Much better. The food is still up to scratch. The tempura onion rings are so good I would be hard pressed not to walk in an order a bowl of those with a beer whenever I am nearby.